Longganisa, the skinless kind, is a childhood favourite of mine. For some reason, growing up, we've only had the skinless kind, made at home, most probably because of Yaya's inherent distrust of commercial goods. Among folks of her generation, there was the impression that anybody who makes food to sell for a profit will make that money often if not always at the expense of the consumer, shiny, glittery ads with celebrity spokespeople notwithstanding. The skinless longganisa of our childhood -- Yaya's or others' -- were always about the size of fingers: slender and not too large. Over the years, however, our lack of industry has made them larger and larger, and heftier. left: finger-sized; look at all those bits of fat! Recently, we've even made patty-shaped longganisa for a burger party. We had "longganisa burger patties" and beef patties. The longganisa ones outsold the beef patties! In the case of commercially-made longganisa, there was a fear of preservatives and artificial colours. But most fearsome of all was the mysterious "filler" in these sausages -- as in, we didn't really know how much and what kind of "filler" were in these longganisa. Following Yaya's recipe, which I found to be consistent with other recipes of skinless longganisa among our circle, we have been making these skinless longganisa now for quite a number of years, but lately, I have been somewhat dis-satisfied with the texture of the longganisa. In the past couple of years, I found that they could be on the "tough" side, perhaps it's because we've been making them so large. Especially eaten after being reheated, these sausages are just too dense and meaty for me! And so it is time to overcome the fear of the filler and embrace it. 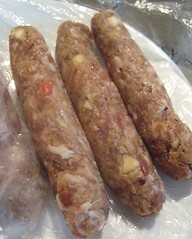 Lately, I have taken to adding breadcrumbs to our skinless longganisa to achieve what I think to be a better texture. I could, I suppose, also add more fat, but at this juncture, breadcrumbs are more available. 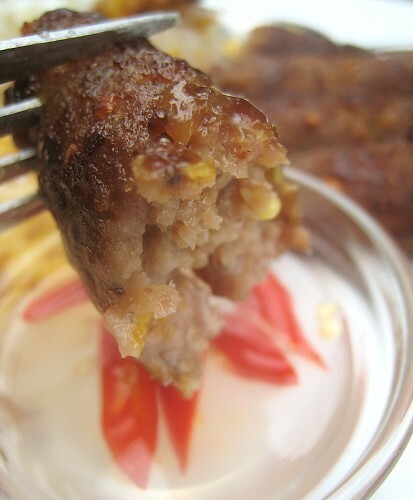 Since longganisa are eaten with chile-infused vinegar (sinamak) as condiment, I have taken to adding chile peppers and vinegar right in the pork mixture as well, to great results. 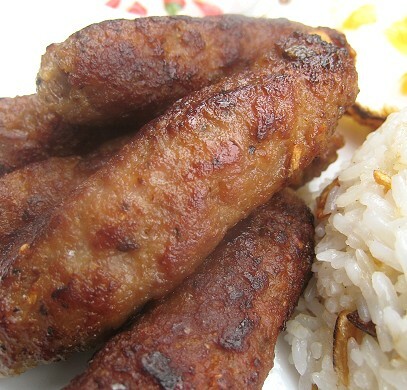 After mixing the ingredients -- ground pork, brown sugar, Worcestershire sauce, "filler" and seasonings -- and forming them into slender "ladyfingers", the longganisa are usually pan-fried over medium/medium-low heat (to prevent the brown sugar from burning). 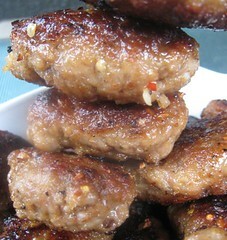 But, we have also taken advantage of our hefty sausage shape and grilled them! 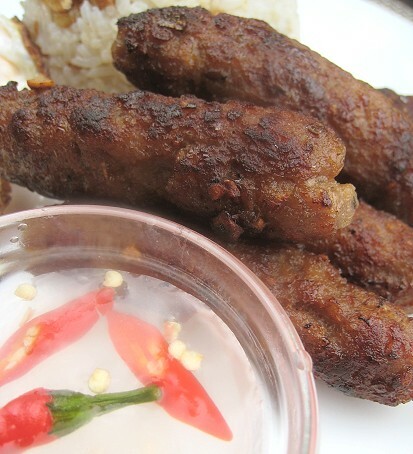 Marvin, at Burnt Lumpia, has a couple of very elucidating entries on longganisa and the regional variations of the genre. One of these days, I have to get myself a grinder and make my own longganisa with skin. I kind of miss the casing in our sausage incarnations. Yaya's original recipe; my revisions are in italics. Combine all ingredients together and roll into sausage form, about the size of fingers. Pan-fry over medium/medium-low heat, careful not to burn the sugar in the sausages. Serve with plain white rice or sinangag (Philippine Garlic Fried Rice), and with chile-infused vinegar as condiment. Hmm, I don't miss the casing at all. Naked porky goodness! 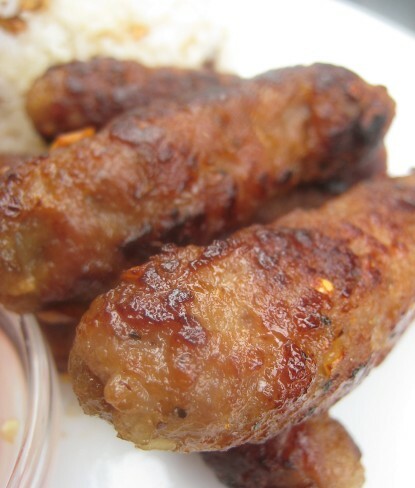 I love the hamonado type of longanisa, probably more than the recado type-- loving this!! 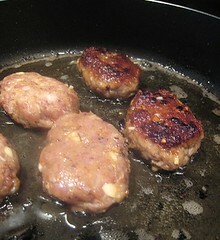 You can also flatten them a bit, a la McDonald's longanisa (which I love, don't judge). Yeah, probably a good idea not to make them too large. I can only imagine there are many ways that can go wrong. mmmmmMMMmmm....they look and sound amazing! Longsilog used to be my favorite Filipino breakfast meal until my dietitian told me to avoid it. Your post is making me crave and is persuading me to go on a diet holiday! I am drooling..... sounds so yummy and the beauty is that it's so doeable even from Switzerland : ) I have to come back for this recipe. You rock!!! Between you and Marvin, I should be shamed into making my own longanisa already! This looks absolutely delicious!!! I and totally drooling...mmmmmmm! Oh my this is absolutely delicious!! Im drooling! 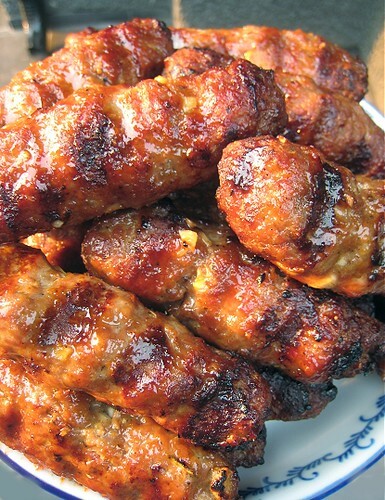 Loving the grill marks on those longganisas, I have yet to try them grilled (too lazy to set up the grill, hehe). That will be so nice to do now in the summer. Thanks for sharing the recipe. I love the idea of adding flavours of the sauce into the food iself. That kind of thing really brightens up meals and makes the sauce taste even more perfect an accompaniment. 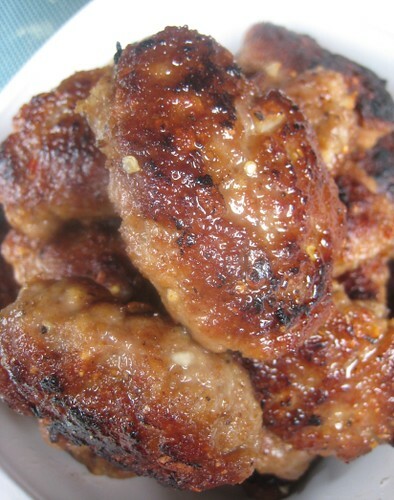 These remind me of chevapchichis, skinless sausages that a Bosnian friend's parents make. It's a very sweet sausage; definitely goes well with the chile vinegar. I always regard those longganisa w casing with a little suspicion. ;) And, I don't know what hamonado and recado types are! Wow, McD's has longganisa? Ooooh. Haha... I guess those toppings would be all right. =) I think we just had normal burger "toppings" that get-together. Yeah, totally accessible ingredients, this one. Oh, I've never heard of chevapchichis... will have to look into that. Just bought a KitchenAid mixer and meat grinder attachment. Pork shoulder and legs on sale at T&T. Guess what I'm making this afternoon?